It was the most entertaining evening I’ve spent in years, much better even than the O’Reilly Factor . And I left with an "I Love Capitali$m" poster, which is one of my prized possessions. 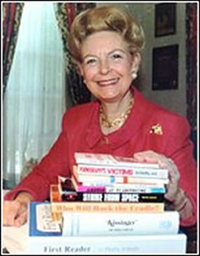 Ms. Schlafly did what I take to be her usual stump speech-–opposing judicial activism and, of course, feminism. She was plugging her new book, The Supremacists (about left-wing judges). She had some amusing lines. Something along the lines of, “Feminists are pushing their way into the military. Forty-five percent of women can't throw a hand grenade far enough to keep from killing themselves. So I guess you can say that feminism leads to death. Ha, ha, ha.” I took the laughter to be a realization that her arguments in this case were laughable–a wonderful self-insight. I have a warm spot in my heart for people who don’t take themselves too seriously. It’s an appealing character trait, to be able to be not too serious. Wish I had more of it. Ms. Schlafly, I think you’re an antique. You’re turning off a significant part of your conservative base. I am a young conservative woman. And I am in law school to be a good role model for my child and to provide for my family. Telling women not to work is alienating people who agree with a lot of conservative values. Reminds me how successful the feminist agenda of the 1950s and 1960s has been. Now virtually all young women (or at least many young conservative women) aspire to professional careers. But here’s the punch line that really cinches this story. I later learned that the law student was, a few years ago, Miss Mississippi. What a great debate, between two conservative women, one an icon of the 1950s and the other an icon of the 2000s. Fifty years from now, some American Studies scholar will be wishing that she had a tape recording of that evening–and particularly that exchange.